Size of this PNG preview of this SVG file: 800 × 400 пиксел. Бусад зургын нягтрал: 320 × 160 пиксел | 640 × 320 пиксел | 1,024 × 512 пиксел | 1,280 × 640 пиксел | 1,600 × 800 пиксел. Date 10 July 1948 (introduced); 8 September 1948 (official); 1992 (standardized). 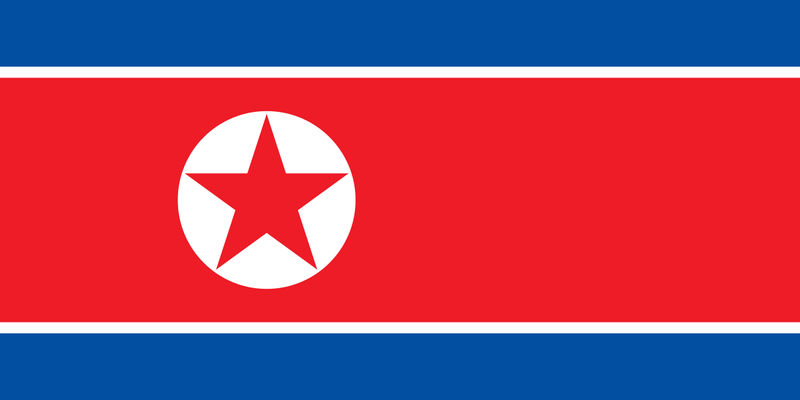 Эх үүсвэр Own work based on: Flag of North Korea.png by SKopp. (Хамгийн сүүлийн | Хамгийн эхний) Харах (илүү шинэ 10) (илүү хуучин 10) (10 | 20 | 50 | 100 | 250 | 500). 04:13, 17 Нэгдүгээр сар 2011 1,600 × 800 (873 Б) Zscout370 The official DPRK specs do not give anything about colors to my knowledge (or that could be found) but I think we need actual links instead of "based on photos" because we seen lighter colors before.